My first visual acquaintance with an Atlantic cable began at Woolwich, London, England, in the central street of the Siemens factory, or electrical village, as it might be called, since it is made up of several buildings, has a dock of its own, runs its own little hotel for officers and guests, and has a population of over two thousand. In this street, before the entrance to one of the workshops, were piled great coils of copper wire. This wire, I was informed, was to be the "conductor" in a new cable which was then in process of construction, copper, in marine lines as in land lines, having been found to carry the electric current better than any other available material. But it must be good copper; for only in proportion to its purity is it favorable to the passage of the current. Each hank of this copper wire, which lies ready to trip up the feet of the unwary in the factory street, is carefully tested for resistance before it is set aside to go into the cable; that is, a sample of it is compared with a standard which has been selected. A bit which shows less than ninety-eight per cent. of the standard is thrown out. But this happens rarely. Even if it shows the required conductivity, however, it must not be supposed that it is ready to go at once under seas. In the first place, a single wire is too easily broken. To make it stronger it is spun into rope. Each hank of accepted wire is first wound on a spool. Twelve of these are then taken (the copper conductor may have more or less than twelve strands, but twelve was the number used in the cable I am describing), and mounted on a spinning machine. The threading of this machine is peculiar. One spool is placed in the centre, and the strand carried horizontally to a guide, and then on straight to an iron "nose," through which it passes. The eleven remaining spools are placed in iron frames, and mounted in a circle around the central spool. The result is a wheel of spools, one forming the hub, and the other eleven the tire. The wires from the eleven exterior spools are carried through eyes on to the guide, through which the central strand passes, and then to the "nose," where they meet the central wire. The machine is now threaded. When started, the central strand is fed horizontally into the "nose"; but as the wheel of outer spools rotates, the spools themselves keep always a horizontal position, just as do the baskets in the Ferris wheel. The result is that the eleven wires, in entering the "nose," are twisted by the revolution of the wheel around the central one, and that, as the whole passes from the "nose," we have a rope of copper wire. It is the conductor. If by chance one strand of it is broken, the usefulness of the whole is not injured. Indeed, ten of them may be broken in one place, and all of them at different places, and the conductivity still not be destroyed. When the "thread is out" there should be about one nautical mile of copper rope, which, if nothing has happened to the wire in its passage through the machine, will be found, when tested, to be an admirable conductor. Admirable as it is, however, it would be utterly useless under water, for while electricity will travel so fast in copper, it will not stay there if it can help itself. "Electricity a good workman!" I heard an irritated London telegraph manager exclaim. "Why, it takes a battery of seventy cells to work the land line between Land's End and this town, just because the current is always watching for a chance to waltz down the pole and go home again." And in water, matters are worse. To keep the electricity in the copper rope, then, the cable-maker insulates it; that is, he packs round it a substance which offers a great resistance to the passage of the current. The substance chosen is gutta-percha. As the specific resistance of gutta-percha has been estimated to be 60,000,000,000,000,000,000 times that of copper, it certainly looks as if it were equal to the task assigned it; and, as a matter of fact, it does very well. 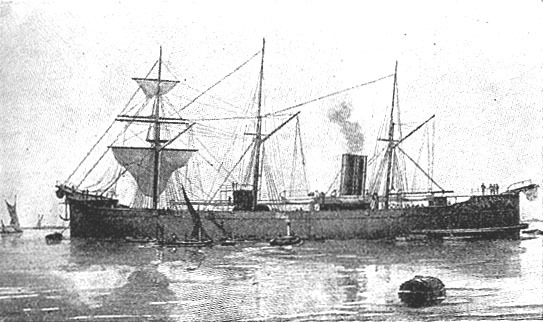 The gutta-percha used at Woolwich comes direct to the factory from Singapore; and in as virgin a state as Malay and Chinese adulteration ever allow it to depart in. It arrives in big lumps which often have grotesque shapes - rude animals, droll human figures, things never seen "on sea or land." The lumps are sliced into small pieces, softened by hot water and steam, and torn to pieces in a "develling" machine to get rid of the sago-flour, sawdust, clay, and stones put in by enterprising Orientals. When cleansed, it is passed into a series of troughs, where it is steamed, crushed, pummelled, and twisted into a reddish-brown substance of an extraordinary rebellious look, quite capable, one would think, of resisting any amount of electricity. More rolling and beating reduce this mass to a pliable condition, and when it comes from the final rollers it is in sheets of varying thicknesses, which are soft and supple, and adapted to all sorts of uses. It is the thicker sheets which are used to insulate the copper rope. They are packed around it so firmly and smoothly that not an air-bubble can remain between conductor and insulator. When the insulated strand, or the "core" of the cable, as it is henceforth called, passes from this operation, it must go to the testing-room, to determine if the insulation is really perfect, or if a little electricity still can escape from the copper. It would be useless to make this test in the air, since even without an insulator the current does not pass readily into air. It must be tested under water, in the medium in which it is to be employed. Shallow tanks filled with water receive each section; and after a section has lain twenty-four hours in the water in order to come to the same temperature as the water, the test is applied. If the effect which ought to be produced on his galvanometer by passing into the core a certain quantity of electricity, does not result, the electrician knows that there is a flaw, and that the insulation is imperfect - that is, that the electricity is escaping. There is nothing that can be measured with more accuracy than electricity. The laws which govern its flow in a body are perfectly understood. The electrician knows how much he pours in. He can draw it out, measure it, treat it, in short, as if it were water in a pipe. A leak in an electric wire is dealt with almost as a leak in a water-pipe is, and can be located quite as exactly. When once located it is easily repaired. Each section of core is, as said above, about one nautical mile in length. As the line in question was to cover 2,201 nautical miles, it would comprise 2,201 sections. The sections, as fast as they had passed the testing-room, were stored in tanks under water until the time came to joint them. Jointing is one of the most difficult and delicate operations in cable-making. It must be so done that every one of the twelve copper wires in the conductor is perfectly joined and also perfectly insulated. The least imperfection at the joint may cause a future expense of tens of thousands of dollars, and untold inconvenience to business and loss of credit to the makers. To see a joint made I climbed, on one of my visits to Woolwich, up into a swallow-nest of a cabin, fastened in some mysterious way to the side of a wall of the "core " tank-room. In the centre of the little room sat an imposing individual, whose characteristics seemed to be rotundity, profuse sweating, and absolute cleanliness. An assistant shared the narrow space with him; a few simple iron tools and several big gas-jets served as his equipment. By the time I had succeeded in perching on the edge of this aerial workshop in such a way as not to fall into the gas-jet burning at my elbow, or into the cable-tank gaping below, two lithe, shiny, black cable-cores were passed up to the assistant. With them came a tag bearing the. number of the joint to be made, for every joint in all this two thousand miles of cable is numbered and recorded, and its history, from the day it is made up here in the jointer's nest until it falls into the sea, can be traced. First the assistant cut off a few inches from the two ends; pared down the gutta-percha in such a way as to leave two or three inches of copper conductor uncovered; bevelled each end with a file, laid them together, soldered them, and then wrapped the joint tightly for the distance of half an inch with fine copper wire. This wrapping insures a connection in case the soldering should some time break. The other man so far had done nothing. It was explained that in the work of jointing the copper he was not allowed to share lest it should "spoil his hands." His duty was to joint the gutta-percha, an operation in which much depends on delicacy of touch. When the copper joint was done, the core was passed on to him, and he proceeded to pare down the gutta-percha until he had perhaps a foot in all to work on; he then heated the gum on each side with a spirit-lamp, and with his fingers worked it down until the copper was all evenly covered. His next step was to build up the insulator. One after another, strips of gutta-percha, which had been heated at the end, were applied, wound around the core, and carefully worked and moulded the length of the wound. Should a bit of dust, an air-bubble, a speck of moisture, be left in the insulator, it would give trouble later. Hence this heating and kneading and caution against dirt. Experience has shown, too, that no machine will pack the gutta-percha at this critical point so perfectly as the human fingers. They alone can feel when the work is progressing properly and is finished satisfactorily; hence the care to keep them always sensitive, to prevent their becoming callous by rougher work. The joints of each day are tested at night by the electrician, first for their size with a gauge, and then for the insulation This latter test is simple and interesting One end of the length of core is applied to a battery, and the other insulated in the air. The joint is then laid in a dish of water, placed on an insulated table, and a copper wire is run from the water to a galvanometer. The current being turned on, any electricity escaping from the joint must pass into the water, be taken up by the copper wire, and marked by the galvanometer needle. If none escapes, or not more than the amount allowed - for no absolute insulation is possible - the joint is marked "passed." The "core" is now finished. But as it now stands it is in no wise fitted to meet the shocks that await it at the bottom of the sea. It must be protected against the chafing of sands and rocks and the possible wrenches of anchors. This protection lies in a sheath of steel wires, separated from the soft gutta percha of the core by a packing of jute. The jute is spun about the core exactly as the eleven copper wires of the conductor are spun about a central wire; and about all, finally, is spun the steel sheathing in the same fashion. As one goes about among the spinning machines, he notices that the sections of steel sheathing vary much in thickness. Here is one woven of twenty-four wires, one of thirteen, and one of twelve. And the wires also vary; so that the section of fewest wires is the largest in diameter. Here is a section made, not of single wires at all, but of strands of three wires, In fact, one sees seven different varieties. The occasion for such diversity is this: In the middle of the Atlantic a cable is dropped to a depth of two or three statute miles, and as it is payed out to such a depth it must have a great burden to sustain in its own weight. To make the weight as little as possible, consistent with needful quality and strength, becomes therefore important. The deeper a cable is laid the less its liability to disturbance, and the deep-water sections therefore may be made much lighter than the shallow-water sections. As the cable draws nearer the shore, where the dangers grow greater, a heavier and heavier sheathing is adopted, until, in what is known as the "shore end," comes the heaviest of all. As the finished cable comes from the sheathing machine it is given three or four coatings of tar. From these tar baths it is run out of the strange weaving-room over pulleys into the tank-house, wherein it is stored under water until the time comes to take it to sea. It is an interesting operation. 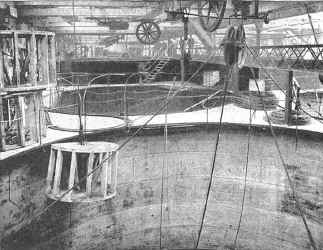 As the cable comes over the pulleys into the tank, the men at the bottom guide it evenly round and round in great coils from the rim to the cone which fills the centre. It is not so simple a matter, and every coil must be watched to keep it from kinking or from overlapping the last. While one man runs and round, guiding the cable into place, others at equal intervals hold the coils in position. Of the lengths of cable thus stowed away, the ends are always left accessible; so that connections can be made with the testing apparatus, for the testing still continues at frequent intervals even on the finished cable. As soon as a fair portion of a flake is laid, a curious operation begins - giving the cable its whitewash bath. This is done to keep the freshly tarred coils from sticking. At the end of each day's work the water is turned on, and the cable is left to soak in its element. Indeed, it is never left long enough without water to become dry. 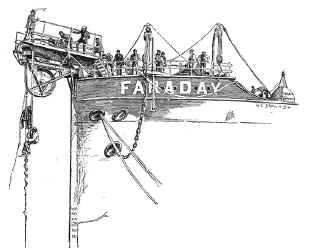 When enough cable has been finished and stored in the tanks, it is conveyed aboard the cable-ship "Faraday," to be carried to sea and laid. 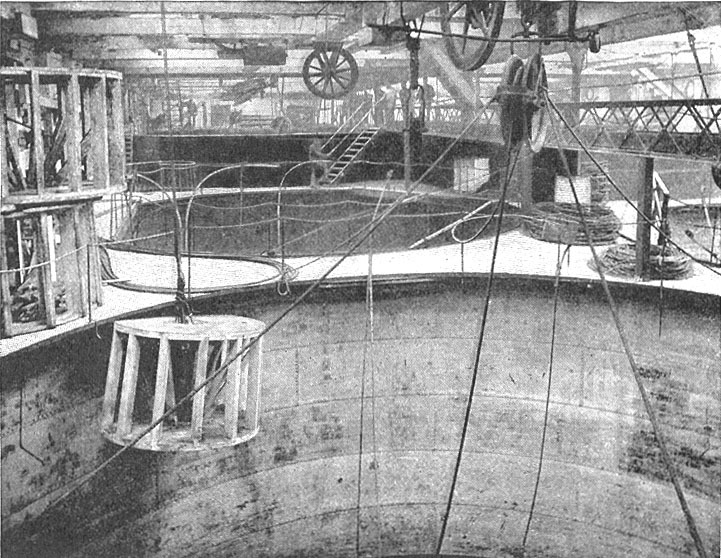 The "Faraday" lies moored in the Thames, and the cable is paid rapidly into her hold from the top of the tank-house, passing, in its way, over scaffolding rigged up on a couple of barges to support it, and leaving on pulleys and ways, as it passes, great streaks and blotches of whitewash. There are three iron tanks on the "Faraday" built into the frame of the ship, and holding altogether 1,700 miles of deep-sea cable. The two larger of these tanks are each forty-five feet in diameter and thirty feet deep. The cable is coiled into them just as it is in the tank-house ashore, but with much more bustle. The tanks are larger; the workmen are more numerous. There is always a circle of spectators hanging silently over the rim, half-hypnotized by the huge swaying, writhing cable, by the steady running of the men, by the crooning songs into which they break when all goes smoothly. It is hard to get away from the tanks, though it is a mistake to stay there too long. There are too many other things to see. First of all, there is the testing-room, for now, as always, the end of each length of cable is within the reach of the electrician, and receives its daily test. The testing-room lies nearly amidships, forward of the engines, where it feels as little as possible the vibration of the twin screws and the pitch in heavy seas. It is supplied with all the appliances for electrical testing: batteries by the score fitted against the walls, condensers, testing-boxes, telegraphic apparatus for signalling to and from the shore when the cable is paying out, and, on a large table in the centre, the most essential of instruments, the marine galvanometer. In laying a cable it is of the first importance to have the cable always under control. Control is secured first by passing the cable under and over a series of grooved iron wheels, running aft down the centre of the ship's deck. The hold thus obtained is considerable, but it is the greater if the cable comes slightly bent from the tank. From the series of wheels the cable runs over a pulley, and passes three times around a drum some eight feet in diameter. Connected with this drum is a brake which is used to restrain the cable from paying out too fast. A cable pays out too fast when it goes to the bottom slack instead of taut; and, in spite of the fact that the ship is always steaming ahead, and the further fact that the water in its resistance supplies something of a check, yet as the cable weighs some two and a half tons to the mile, its own weight would pull it over much too rapidly, were it not stopped by the brake. Aft of the brake there is an instrument called a dynamometer, which shows exactly the strain to which a cable paying out is subjected. This strain is signalled to the man at the brake by an arm which rises and falls, and he, knowing just what strain is allowed, manipulates his brake accordingly. From the drum the cable runs to the stern-baulks - a projection carried out from the stern to keep the cable clear of the propeller - and drops into the sea. 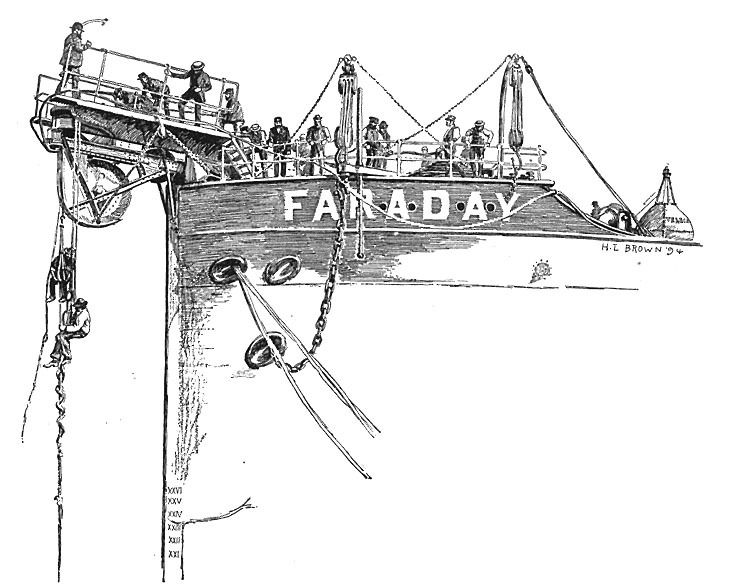 When the "Faraday" moors off the starting point, the end of the cable passed over the stern-baulks is carried ashore, run into a testing-house, and communication with the ship is at once established. As soon as the end is safe ashore, and it has been proved that there has been no disturbance of conductivity in landing, the paying out begins in earnest. The scene on board a cable-ship is novel in the extreme during the regular work. The ship exists for the cable, and during the paying out it is the cable's staff which gives the orders for the manoeuvres. The signals are placed at the bow and stern, in order that the orders to the engine-room can be given according to the demands of the picking-up and paying-out gear. The cable crew is really threefold: that in the tank, presided over by a cable foreman, which sees that the cable goes out of the tank to the machinery all right; that at the stern, presided over by the cable engineer, which sees that the cable passes properly into the sea; and that in the testing-room, which is responsible. for the electrical condition of the cable. The captain is supposed merely to put the ship where the navigating officer wants her; that is, to follow the cable's path at the speed necessary for the work. This path, in the case of an Atlantic cable, is well known. The hills and valleys of the Atlantic bottom between Ireland and Newfoundland are as clearly marked on the chart as the hills and valleys on a map of England. In spite of the whitewash, the coils sometimes stick together, and two or three come up together, fouling in the most baffling way. The eye of the cable foreman is always on his charge, however, and at the first indication of kink or foul he can signal to the engine-room to stop. It is in the testing-room that the watch is probably closest. The "spot-chaser," as the electrician is called in cable-ship argot, perched on a stool, keeps his eye fixed on the spot of light by which the motions of the magnetic needle are marked on the scale, and if for an instant it quivers and hesitates, or if, surest sign of all, it suddenly gasps and disappears, he knows that there is something wrong, and instantly signals to stop the paying out. Then a search begins for the fault or break. Sometimes this means the hauling in of long lengths of cable already paid out, though usually the flaw is in a part still in the ship or only just passed over. The chances of an accident to the cable after it is well clear of the ship are, of course, small. Science and experience, however, have now reduced the chances of accident to the minimum. 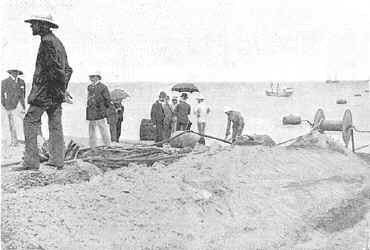 In the early days of cable-laying, when the whole business was more or less of an adventure, even so skilful a cable engineer as Fleeming Jenkin might well say "that life, when working with cables, was tame without difficulties." 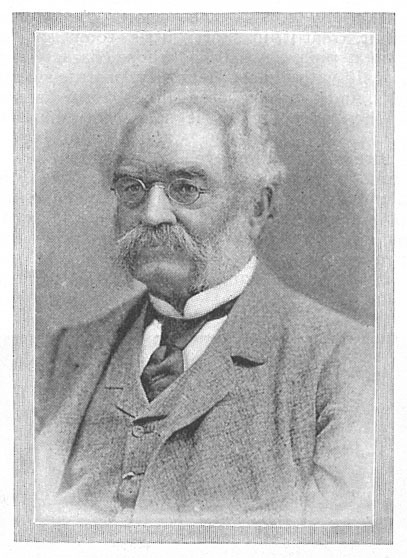 But the modern engineer encounters his most serious obstacles in the draughting-room, the testing-room, and in the factory; and the laying is in the main a gratifying demonstration of complete accord between results and calculations, and so an occasion less of trial than of triumph. When the "Faraday" has laid the shore end and some lengths of an Atlantic cable on the European side, she drops the end. There is no risk whatever in this. The end is properly insulated, to begin with; and then the cable is bent firmly around a mushroom anchor, which has been fastened to one end of a chain. The other end of the chain is attached to one of the huge iron buoys which decorate the "Faraday's" deck, and with a rattle and clamor from men and iron, the whole goes sliding into the sea. As the waves catch the great iron bladder and toss it merrily up and down, the crews give a hearty cheer and a gay "till we meet again." And away steams the "Faraday" for Nova Scotia. The same operation which we have been tracing from the European shore is repeated from the shore end on the American side. When the "Faraday" has laid some seven hundred miles of cable and her tanks are empty, she steams back to Woolwich to take on a new store. This time she takes aboard the deep-water cable - a different variety from the cable she has just laid. In a month she is again en route, bound for the end left buoyed on the European side some six months before. A landsman has difficulty in realizing that a sea-captain can find his way directly to a particular spot in an apparently shoreless sea. Latitude and longitude seem to him to lose their meaning when there are neither hills nor valleys to fix them to. But not so to the captain; he will turn his ship's head to the buoy without veering. And if the buoy is gone, which may happen from accident or malice? Well, the cable itself is below, out of the reach of storm and meddling; and the first thing to do is to pick it up. To pick up a cable two miles or more under water does not seem simple. Indeed, so impossible did it seem thirty years ago that many people contended that laying deep-sea cables was nothing more than gambling, since the probability was that they would be lost in the operation and it would be impossible to recover them. And, indeed, there was trouble enough recovering lost cables in the earlier days. But thirty years' experience and stufy have overcome all difficulties, and it is now possible to pick up a cable even when lost as deep as three miles. The picking up is managed in the following way: Over the cutwater of the bow there runs a narrow projection, similar to the stern-baulks, and called the bow-sheave. On the bow is a large guide-wheel, and farther aft a big machine called the picking-up gear. It is similar to the paying-out gear at the other end of the deck, though heavier, having, like it, a drum, a brake, and an indicator. Suppose that the end of the cable which the "Faraday" wants is lying a mile down. A manilla rope, strengthened with steel, something over a mile in length, is attached at one end to the drum of the picking-up gear. To the other end is fastened a grapnel. This instrument is simply a huge fishing-hook of six barbs, which vary from short and stubby to long and thin, as the bottom on which the grapnel is to be used is rocky or sandy. When all is ready the grapnel is thrown overboard, and the ship wheeled around at right angles to the course of the cable. By steaming slowly ahead, the ship drags the grapnel across the path of the cable. If nothing is hooked, the ship turns and recrosses. She thus plays back and forth over the path of the cable until something finally is hooked. The moment that the grapnel catches there is a strain on the rope, which is at once shown on the indicator. If the grapnel continues to hold as the ship pulls continuously at it, the ship is stopped; the picking-up gear put in motion, and an attempt made to wind in the rope. If it is the cable which is hooked, the rope will continue to rise, and the strain on the dynamometer will increase as more and more of the cable rises. When this happens the cable engineer is certain he has the end sought, for no other object could be hooked which would produce this result. If the grapnel is caught in a rock, which happens frequently, the rope will not pull in, and the barb caught will either be pulled loose or will be broken off. 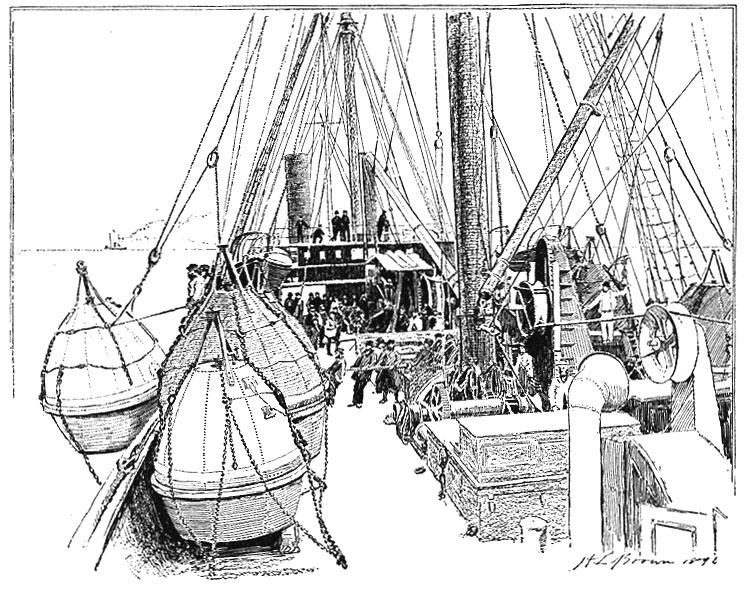 The essential points in picking up are that the ship be easy to direct - the "Faraday" will turn in her own length - that the rope and grapnel be strong enough to support immense strains, and the gearing so heavy that the tug of the cable and the jerks that must come upon it in winding in a great weight in an unstable element like the Atlantic, will not loosen the grip. The loose end recovered, the next step is to make a joint with the cable on board. With the core this is done exactly as we saw it done in the factory. In the jute packing and the steel wire sheathing the joints are made at different points over a distance of several feet so as to distribute the weakness. As soon as the joint is made the ship is of course again in communication with the shore. She now begins reeling out the deep-sea cable. 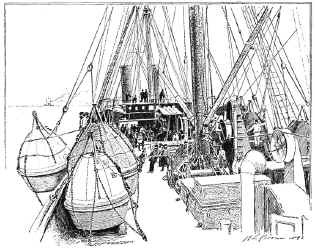 The work is done in about ten days, and the ship has reached the loose end left from the first paying out on the American side. It is a short task to pick up the end, connect it with the end on board, and test the work. This done, the cable is done; Europe and America exchange congratulations, and the ship is free to go back to Woolwich. The cable is finished, but it is not certain that the "Faraday" has seen the last of it. Cables have their adversities even on the bottom of the Atlantic. Icebergs passing over sometimes cut them in two. Volcanic eruptions sometimes injure them. A few years ago three Atlantic cables went down at the same time and in about the same spot. No other explanation has been found but volcanic disturbance. Near shore the risks multiply. One of the commonest is the anchors of fishing smacks, a whole fleet sometimes riding on a cable at once. The rocks and breakers near the coast are also dangerous. An Atlantic cable has, fortunately, few animal enemies, though in the English Channel, the Irish Sea, and the North Sea the teredo, the special cable pest of the Mediterranean, does some mischief. This "miserable little mollusk," as the cable men call it, first made itself a reputation by eating up wooden ship hulks, until builders took to plating them with iron, and by burrowing into the dikes in Holland until the whole country was threatened with inundation. When the cable came, it took to it at once. It wriggles its way in between the steel wires of the most tightly wrapped core, and eats away jute and gutta-percha until there is nothing but a wire skeleton left. Happily, however as already indicated, our own particular cable has little to fear from the teredo; and the best wish we can give it, as it lies at the bottom of the Atlantic, is that it may never have a history, and that the time may be long before the "Faraday" sees it again.